It wasn't exactly "Picnic Time" for these two teddy bears, as they tussled over potential trademark rights in the placement of a heart inside a stuffed bear. 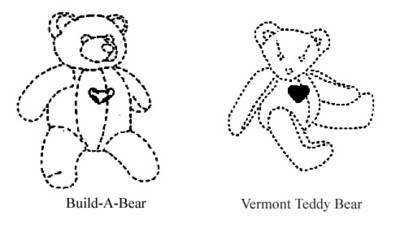 The TTAB granted summary judgment to Applicant in Vermont Teddy Bear Co. v. Build-A-Bear Workshop, LLC, Opposition No. 91115198 (December 17, 2004) [not citable], and dismissed this Section 2(d) opposition, finding that Vermont's prior use of a heart "does not constitute trademark use and is not protectable under the Lanham Act." ". . . a three-dimensional heart shaped object. The outline of a teddy bear is used to signify the placement of a heart shaped object inside a stuffed or plush toy animal; the teddy bear design itself is not claimed as part of the mark, as the heart-shaped object may be placed in any stuffed or plush toy animal." Opposer Vermont Teddy Bear claimed prior rights in the use of a heart-shaped object in a stuffed toy animal, but the Board found that Vermont's use consisted of "advertising and selling toy animals and toy animal kits, usually teddy bears, that include a heart-shaped object and instructions for the consumer to insert the object into the toy animal." The Board concluded that "the procedure or step of placing the heart-shaped object in the toy animal's chest by the consumer" did not constitute trademark use and could not be accorded protection under the Trademark Act. "Opposer's proposed mark fails to meet the definition of a trademark or service mark and, thus, is not capable of distinguishing opposer's goods or services. * * * Even under the concept of 'trade dress,' which expands the Trademark Act's definition of a 'trademark,' trade dress is not so pliable as to give exclusive rights for the concept of placing a heart inside a stuffed animal." "Although the opposition is being dismissed, we note that this does not mean the subject application will ultimately mature into a registration. Should applicant file a statement of use and specimens of use in support thereof (which is required for the mark in the intent-to-use based application to be registered) the USPTO examining attorney may at that point refuse registration on various grounds, including failure to function as a trademark under Sections 1, 2, 3 and 45 of the Trademark Act." 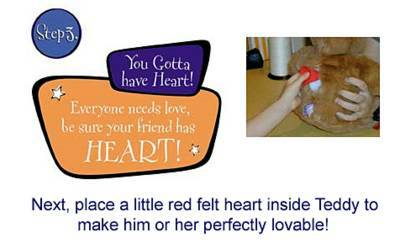 Build-A-Bear is apparently doing the same thing as Opposer Vermont: it supplies the heart, and the customer places the heart inside the stuffed toy. The PTO seemingly should ultimately bring to bear the time-honored, black-letter law principle: what's sauce for the stuffed toy goose, etc.